Melinda Lewis was the queen of halloween. in her honor, we aim to help others affected by cancer. Halloween is about more than giving just candy. We aim to gather donations and aid for those affected by cancer. These donations will go directly to those in need. Donations will be gathered that can help in everyday needs, that can become cumbersome when going through all that comes with cancer. Groceries, bills, and many aspects of life can become too much. Let us help. To nominate a family, or find out more on how you can donate, simply fill out the form below. Please, let us know why you you are nominating someone. We will contact you with more information. 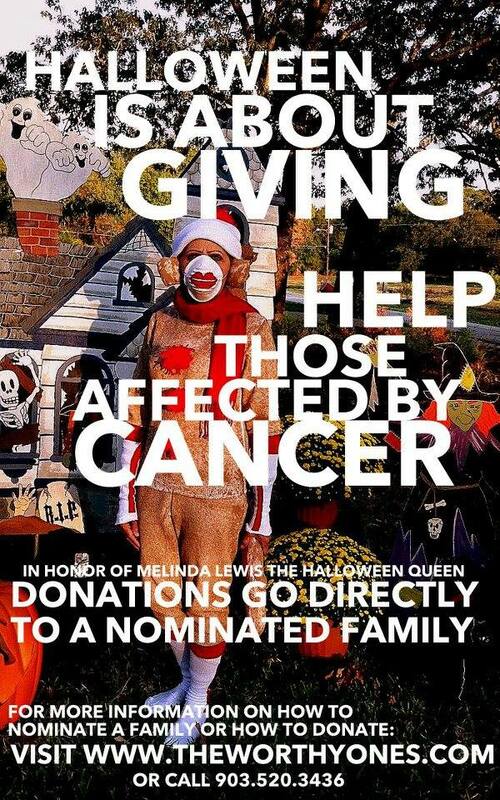 Please, meet our 2018 recipient of the For Melinda Halloween Cancer Fundraiser. This is Jennifer Perkins. She is a wife and mother of the age of 45. She is battling breast cancer that began in 2014. It has now metastasized to her bones and lungs. Perkins is fighting back with cemo treatments. She is currently unable to work, but she has many goals she is striving towards. She has been nominated by a friend that states she is the most positive person to have around, “she is more concerned with quality of life rather than quantity”. Help us raise money for her and her family during the fight of her life. Have you noticed that bus stops are sizzling hot in the Summer? With no access to water, our neighbors were hot and at the risk of dehydration. So we asked the community for water coolers, and they came through in a big way! We also had huge help from local businesses like Morrison Supply, Derrick White, Stanley's Famous Pit BBQ, Net Health, JP Stanley Construction, Tinderbox Design and Nora Schreiber. We need your help stocking coolers with the donated water and ice. We do this every Summer. This marks the second year for the Sock Drive. We encourage others that can, to donate what they can. Last year over 200 pairs of socks were donated to those in need. We aim to make a larger donation every year, including 2017. Socks and monetary donations are accepted in any size. Please, help us help someone keep their feet warm in these colder winter months. This is a drive to stock up the supplies for women who are going without their monthly supplies. We collect tampons, pads, liners and all other feminine hygiene products for our friends. You too can be a bloody do-gooder!